"This was the first talking machine made by Bally." 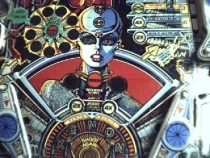 Xenon is probably best known as Bally's first talking pinball and featured a female voice as well as a male voice. It used the double backglass with infinity lighting that was so popular on Space Invaders. 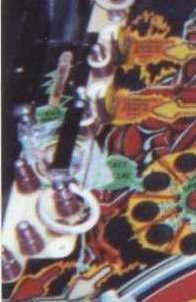 The main feature on the playfield is a ramp on the right side of the playfield that leads to a tube that carries the ball to the left side. In this respect, it was well ahead of its time. The game features two-ball multi-ball, speech, and mini-rollover buttons that knock down drop targets. It continues to be one of the more collectable pinballs of this era. 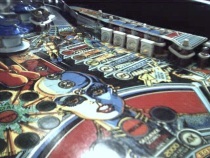 Problem #1: The Coil For the Lower Saucer Was Locked On (A Must Read) This was a simple problem, but provided one of the best examples of how some operators don't have a clue about pinballs. First, some information about how the bottom saucer is used in the game. The bottom saucer is one of the keys to the game. When a shot is made up the right ramp, it enters the tube, goes across the playfield and lands in the lower saucer. This saucer advances the "Mota Value" each time a ball enters. Also, when a player enters the top saucer three times, it lights the lower saucer to lock a ball. Then, once a ball is locked, if a ball is hit up the ramp, one ball is released from the saucer while the other ball is locked. Then, when a player gets the ball into the top saucer three more times, multi-ball is started. Well, when I received the game, the bottom saucer was filled in with nuts and bolts, covered with a thin piece of wood, which was then covered with duct tape. Thus, when a ball was hit up the ramp, it rolled over the saucer and out the gate. Thus, one could never advance the "mota" value or ever achieve multi-ball. What a stupid fix. I wish I had taken a picture of it in this condition, but I didn't think of it at the time. The reason the operator did this was that the coil for the bottom saucer kick-out was locked on. This was caused by a shorted transistor on the solenoid driver board. Instead of replacing the transistor, the operator disconnected the coil, taped the wires together to keep current flowing to other coils, and then covered the saucer on the playfield. If he treated all of his pins this way, I'm sure he didn't make much money on them. No wonder pinball is dying. To fix the problem I replaced the transistor on the solenoid board and replaced the coil. Actually, a pretty easy fix. Note that I do at least a picture of the bottom saucer with a rectangular area around it caused by the residue from the duct tape when I pulled up the tape. Problem #2: Game Settings and High Scores Not Retained. Again, an easy fix. The MPU's battery had been removed. This was a good idea as it helped prevent the battery from causing acid damage to the MPU. Without a battery, game selectable settings and high scores could not be retained. I installed a new AA battery kit with diode to provide power to retain scores and settings. These kits require three AA batteries and help prevent acid damage to the MPU. Above, notice the white rectangle around the saucer. This is the residue from the duct tape that the operator covered the saucer with. Above, new reproduction drop targets were installed. Picture of the center of the playfield which was in very good shape.